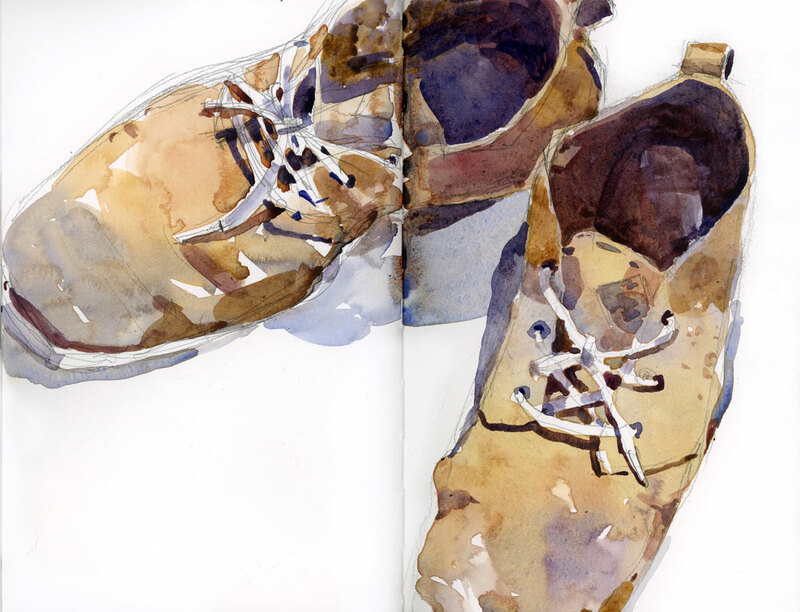 Why are shoes and boots so perfect to draw? I just figured it out. They have all the values I am looking for wrapped up in one object. Lights, darks and midtones, each in the right amount. What more do you need? Sketched in a Stillman & Birn Beta sketchbook using Ultramarine Blue, Alizarin Crimson and Raw Sienna. Perfect! I have hubby’s boots I have been meaning to paint. Glad you like them Ross! Is that being sarcastic, or meant to be funny. Are you referring to my post or Ross’s comment? Nice sketching, I like the lights ! Shari, as a beginning watercolor artist I find your post and your paintings very inspiring and educating. You embrace the fluidity of the paint. You manage to always strike the right balance between simplification and detail (very hard me sometimes). While acknowledging the value point above, I’m very attracted to the limited palettes you choose. They speak to me!! And I appreciate it when you tell me what colors you used in a painting, particularly when it is limited to three. I working towards eliminating colors from my pallet that don’t seem to work for me and your hints about the colors you choose help me see the potential of certain primary combinations. Thank you for sharing with this rookie. Thanks for this Jenny. I appreciate your detailed feedback and I agree with your teacher! If the values notes are correct any colour will do just fine. Value and composition are both so important. I experiment with colour all the time so I’m glad the notes are helpful for you. Love your blog and your daily sketches and paintings! And after I draw them I can wear them to lug my equipment over the cobblestone streets in Old Montreal. Dual purpose shoes!